An orange juicer is a great addition to any kitchen. Few things are more refreshing than a cool and refreshing glass of orange juice at breakfast time, and making your own juice is always advisable. After all, while OJ is available by the carton from any grocery store, wouldn’t you rather know exactly ingredients are making their way into your body? Juice from the store is often filled with additives and preservatives, and can sometimes be akin to filling a glass of water with pure sugar. With a juicer in your own home, you can be assured that you retain every possible nutrient found in the original fruit. That’s why I’d like to help you choose the best orange juicer for your home! 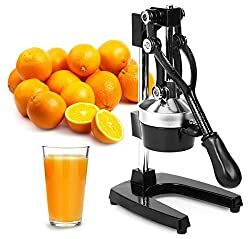 1 How Do I Rate Best Orange Juicer? 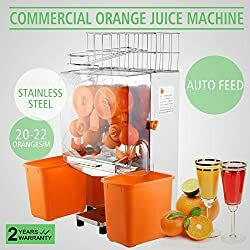 How Do I Rate Best Orange Juicer? You found this article because you’re interested in orange juicer reviews. This is what I take into consideration when deciding upon the best orange juicer to buy. Price is important, and I endeavor to find an option to fit every family budget. It’s not just about the up-front cost, though. I recommend products that provide value for money. Something cheap that breaks easily, or does not do its job, will cost more to replace! Value can also be obtained through a product warranty. I always look for products that provide assurance that a broken appliance will be replaced or fixed. You’re a busy person, and you don’t have hours to spare cleaning a juicer. Only fast and simple-to-clean devices will make my shortlist! Let’s take a look at some of the best orange juice machines that money can buy. These gadgets are sure to have your family enjoying fresh, delicious and nutritious beverages every morning! An electronic orange juicer can be a great labor saving device to have around the home. Here are four fine examples of these helpful appliances. Naming the best orange juicer on the market is largely a matter of personal preference, but for a great many people it is difficult to look past the Breville 800CPXL as the very best of the best. This model is beautifully designed with a classic and elegant stainless steel look, ensuring that all-important ‘wow factor’ from the moment you open the box. With measurements of 11 x 9 x 18″, you can also be assured that the juicer will not dominate your entire kitchen. It nestles neatly into position and works very quietly too. You will barely notice when this device is at work, aside from the delicious, nutritious juice that it produces with little effort or mess! Users can choose how much – or how little – pulp they like in their juice using the device’s bespoke settings. You will not be restricted to just orange juice, either. Naturally, that’s the primary use of the 800CPXL, but you’ll also be able to use it for freshly squeezed lemonade, grapefruit juice or just about anything else that you can imagine from the citrus family! Perhaps best of all, there is little strength or effort needed to operate this particular juicer. Anybody living with restricted movement or poor motor function will not struggle to enjoy freshly squeezed juice as substantial pressure and hand strength will not be needed to use the product. It’s also neat, as the device doesn’t spit or splatter pieces of fruit throughout your kitchen. Once the liquid has collected, all it takes is a flip of the provided drip-stop spout to prevent any leakages. It’s very easy to clean the juicer after use, with the many and varied parts able to be assembled and disassembled with a minimum of fuss. You can even place the parts in your dishwasher if you prefer! The warranty of this product is only for one year, but that should not deter buyers. The juicer is hugely reliable, and in the unlikely event that buyers do encounter a problem with the handle clamp, four additional parts are included to easy replacement. Overall, it is very difficult to find fault with the 800CPXL! I promised to review products to suit any household budget, and this model from Eurolux is certainly a fantastic lower-cost option. This juicer may not have quite as many bells and whistles as some of its more elaborate and celebrated competitors, but there is plenty to recommend it. 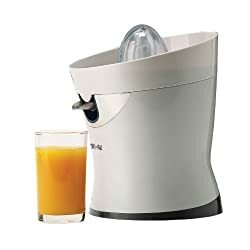 Available in stainless steel or silver, this particular orange juice machine doesn’t leave a huge amount of pulp behind. This makes it perfect for anybody that likes to sip on his or her juice pure, but it’s not the end of the world for those who enjoy pulp. Just scoop a little up from a tray and drop it into your glass before you start! The juicer is very basic, which makes it easy to use. Just insert your fruit, and hold down the lever. This simplicity also stretches to the cleaning process afterward, making this an appealing option for busy people. Whether you’re interested in juicing oranges, lemons or grapefruit, you’ll find plenty of joy with this model. This Electrolux model is ideal for anybody looking for their juice in small doses. It will not accept a tall glass or run for too long without a break, but it’s a great discount model. If you are undecided as to whether juicing is the right thing for you, then I heartily recommend this particular device as a way to begin. What it lacks in frills, it more than makes up with in pure functionality. Picture the scene. It’s early in the morning, and you have risen to tackle the day. You decide to tuck into a glass of delicious, fresh orange juice to start your day… and the clanking, grinding machinations of the device wake up your entire family. The peace is shattered, and what promised to be a heavenly start to the day is now looking like hard work! 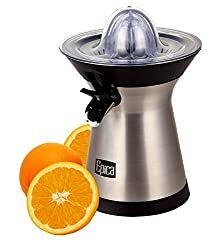 As you may have guessed from the full moniker, one of the selling points of this Epica juicer is the near-silent motor. The fact that it’s so quiet is just the tip of the iceberg in terms of recommendations, however. This electric squeezer is constructed from plastic, which helps to keep the design lightweight and easy to move. In addition to this, anybody can make use of this Epica juicer. Prominent strength and power in the hands will not be required to pour a glass of juice, and the settings are all fairly basic and easy to flit between with a single push of a button. It is most advisable to stick with oranges when using this device, as other citrus fruits with pips could cause a blockage, but it also works at a great speed. This velocity can result in the occasional splash or spillage though, so bear that in mind when positioning the juicer in your kitchen. Happily, the trade-off for this is that the juicer is very easy to clean, with a simple rinse largely doing the trick. If I am to be entirely honest, I have to say that this is not necessarily the sturdiest juicer on the market. This is to be expected from a device constructed primarily from plastic, as opposed to the stainless steel that you’ll find with some competitors. Try not to let this deter you, however, as the manufacturers offer a lifetime warranty on any purchase. Overall, this model from Epica is a great option for anybody new to juicing. Sometimes it’s the simple things that are the most effective, and that also applied to citrus juicers. Comprising of six basic parts that are easily cleaned (although you may need to pick up some pipe cleaners or something similar to really keep this unit sparkling), the CitriStar creates glasses of smooth, pulp-free juice without complicating the process. Fruits have their liquid extracted in one simple, fluid motion using this juicer. Simply apply the orange, lemon or other citrus fruit to the top of the device, which comes in a universal size that accommodates any foodstuff, and wait for the juice to flow as a result. This particular juicer will not be impacted by excessive or insufficient force, either. You can relax and feel assured that nothing will stand between you a glass of fruit juice in the morning! The CitriStar comes with a one-year manufacturer warranty, though thankfully that shouldn’t be required. The device is designed to avoid breakages and clogging, and it’s a sturdy little thing. Standing at 8 x 8 x 9.5″ and coated in a very basic white plastic, it’s also small enough to remain inconspicuous in any kitchen. This exterior camouflage is also complemented on the inside, with the model boasting a very quiet 50w motor. Just be aware though, this juicer not really designed for continuous use without a clean between uses. If you plan to create juice for multiple different people in short order, consider a larger model. For a single individual or a household that will be taking turns, however, this is a great all-rounder and one of the best orange juice extractors around today. As great as an electrical appliance can be, sometimes you can’t beat the personal touch. If you prefer to create your orange juice by hand, these two devices are highly recommended. The item packs a lot of power into just 11oz, promising to deliver around 20% more liquid than an electronic alternative. You may even be able to use a lemon, lime or small grapefruit with this model from Chef’n Citrus. Be aware, however, the same manufacturer offers specialist models available for these fruits. All you need in order to take advantage of this device is place an orange inside and squeeze the handles like a nutcracker. This does mean that you’ll need some solid hand strength. This tool is not ideal for anybody with limited motor function, or somebody living with a condition such as rheumatoid arthritis. If you are able to make use of the orange squeezer, it is hugely effective. One key thing to remember when using it, however, is to treat it with care. Squeezing too hard can lead to the strength of the product working against it, and sending liquid shooting from the sides of the orange – and possibly straight into your eye. That’s no fun for anybody! The tool is created from plastic, which is substantially sturdier than the metal that many manual squeezers use. You’ll be able to keep on creating delicious juices for as long as you need to, and the orange squeezer will feel as reliable after twelve or eighteen months as it did on the day that you purchased it. Cleaning is also as simple as running the tool under a tap and giving it a scrub with a cloth and some soapy water or dropping it into a dishwasher. This product can withstand high heat when placed in such a device, so there is no need to worry! If you’re keen to squeeze every possible ounce of juice from citrus fruit, you could do far worse than the Chef’n Citrus Orange Squeezer. 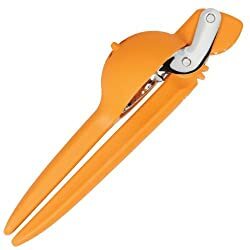 Also available in different, color-coded shapes and models to accommodate lemons and limes, this is possibly the best handheld orange squeezer on the market. This hand-operated citrus fruit squeezer looks a little intimidating at first, but it’s a hugely effective and impactful piece of equipment. This is a professional-standard citrus fruit squeezer that can be used within the home for anybody that plans to generate a substantial amount of juice. There is no end to the number of different fruits that can be applied to this squeezer. You won’t just be limited to the oranges, lemons, and limes listed in the product’s name; you’ll also be able to extract the all-important juice from apples, pomegranates and even pineapples using this tool, making it one of the most flexible hand-operated squeezers around. This functionality doesn’t lead to difficult maintenance, either. A swift wipe with a soapy sponge will be more than enough to keep this squeezer clean and usable, or you even disassemble the working parts with a minimum of fuss and drop them into a dishwasher. The washing itself will be minimal, as not a drop of fruit is wasted when using the press. One thing to be aware of is the weight of this device. At 14 lbs this isn’t something that you’ll want to use in a small or crammed kitchen space, but it couldn’t be any easier to use. Fruit is placed inside the device, the handle is pulled… and a glass of juice is ready to be tucked into. You can also keep going for a prolonged period of time without the device creaking or complaining under the pressure of squeezing countless fruits. Expect to work your way through an entire bag or oranges or lemons without the device even blinking. All of this factorsensure that this is a great bridge between a gadget that can be helpful in the kitchen of a busy family or a business venture. Coupled with a lifetime money back guarantee if you encounter trouble with the device, there are little to tread carefully about with this juice squeezer. If you’re seeking something substantial and reliable, and have space and flexibility in your movements to accommodate it, I can’t recommend this citrus fruit squeezer highly enough. It’s a truly effective method of extracting every drop of juice from those precious pieces of fruit. If you’re running a bar, cafe or restaurant, or even a particular entrepreneurial lemonade stand from your front yard, you will need the services of a commercial citrus juice squeezer. XtremepowerUS, makers of this particular product, are not particularly subtle judging by their company name. Thankfully, discretion isn’t what anybody is paying for in this scenario. This commercial juice squeezer may be large, but it makes full use of every inch of its substantial mass. Just be aware that you will be restricted to oranges, limes, and lemons when using the machine. It’s not quite big enough to handle something more ambitious such as grapefruit. This is because the clearance area at the bottom of the device won’t hold much more than six inches of fluid at a time. The 110V motor ensures that you’ll be able to drop the aforementioned oranges and lemons in at a fantastic rate though, and that will produce around two gallons of juice every minute. This is particularly ideal for anybody looking to serve pulp-free juices, as much of this will be left within the fruits. This does mean that a thorough wash will be required at least once of per day (manual washing with a cloth and soapy water is fine), otherwise flies and other pests will be attracted to the machine. Thankfully the device weighs in at 45 lbs in total and stands at 19.7 x 18.9 x 34.6″, which is somewhat flexible for such a powerful piece of equipment. There is one thing that should be taken into consideration before picking up this commercial juicer, however. The warranty of the product is unavailable without consulting the manufacturer, and while the machine is sturdy enough, replacement parts can be almost impossible to find. This will hopefully not be a concern, but if the livelihood of your business revolves around the use of a sizable juicer, it may cause problems further down the line. Overall though, when weighing up the factors of cost, size and productivity, this is arguably the best commercial orange juicer on the market today. I sincerely hope that this guide has helped you decide which particular juicer suits your family, and your needs. 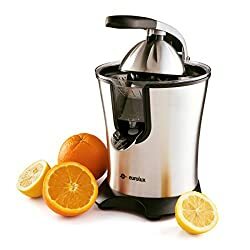 It has been my intention to spare you the time and expense that I put into researching all of the different models available, so I’d love to hear that you found the best orange juice maker possible. 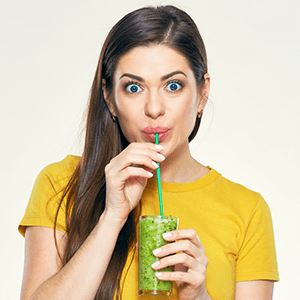 Thank you for taking the time to read my product reviews, and happy juicing!